In the Universal Century year 0079, humanity is divided between Earth and huge space colonies known as Sides. The colony known as Side 3 proclaims independence as the Principality of Zeon, and declares war on the Earth Federation. 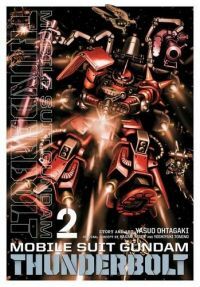 As the conflict nears the one-year mark, the Earth Federation and the forces of Zeon are locked in a fierce battle for the Thunderbolt Sector, an area of space scarred by the wreckage of destroyed space colonies. As the struggle for the Thunderbolt Sector heats up, the Federation mounts a surprise attack on Zeon. Attrition forces both sides to deploy Mobile Suits that are not quite battle ready--the Federation's Full Armor Gundam and Zeon's Reuse P. Device--the "Psycho Zaku." Getting these machines into the fight means tough sacrifices for both sides, and for the ace Zeon sniper Daryl Lorenz in particular. Meanwhile, the Federation must send barely trained recruits into combat. Battle is joined and Lorenz and his Federation nemesis Io Fleming cross swords once again in a bitter struggle for vengeance and survival.